Appreciate the natural beauty that surrounds Bonito Bay, while exploring the untouched beaches and magnificent ocean. The Indian Ocean is home to an abundance of sea life, explore the depths of the Indian Ocean by numerous activities offered at Bonito Bay. 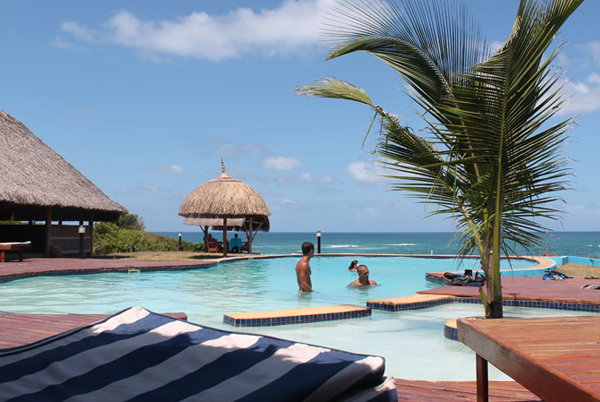 :Situated in the peaceful coconut plantations of Inhambane’s Morrungulo beach, Bonito Bay offers a tranquil and serene setting overlooking the Indian Ocean. Bonito Bay Restaurant Bar serves a selection of simple but quality foods displaying local and international flavours. In partnership with Scuba Galaxy, Bonito Bay offers a professional scuba diving service including diving, snorkelling, as well as whale & dolphin viewing. Dive into the warm Indian Ocean that displays thousands of different fish and coral life, as well as exploring caves and come up close to the magnificent whale sharks that roam in these waters. With untouched kilometres of beach it is the perfect setting for long walks, collecting shells and discovering the many rock pools. Bonito Bay appeals to people from all around the world with an abundance of activities for the entire family to enjoy.